When I was working in elementary schools and the various classes did biography projects, Amelia Earhart was one of the most popular choices (Michael Jackson was probably the most popular choice, but most of the teachers wouldn’t let their students do their projects on him). I wish I’d had copies of Amelia Lost to hand out. This is an ideal biography for fourth or fifth or sixth graders (not that I’ve come to expect anything less from Candace Fleming). I checked this book out months ago and finally, on the day it was due and I couldn’t renew it any longer, I read it in a single afternoon. It’s just over 100 pages and the story hurries along. The format is a clever one – it alternates between the disappearance part (the Coast Guard that’s hearing her radio signals but can’t seem to get her to hear them, the people that, tuning in on AM radios, claim to have heard her over the next few days, and the desperate search for her goes on) and her life, starting at her birth and eventually meeting up with the final doomed flight portion. I loved this because – for me and most readers, I’d guess – her mysterious disappearance is the most fascinating part of Amelia’s story. By not hoarding it for the end, I didn’t feel like I needed to race through the book to get to the “good” part. As happens to me any time I read good history, I realized quickly how much I didn’t know about Amelia Earhart. I didn’t realize how much of her fame was the result of carefully coordinated publicity on her part and the part of her husband (I didn’t know a thing about him either). I had no idea that the world was so caught up in her disappearance and that people knew her voice so well that they could identify it when they heard it on the radio. The main thing I learned was that if you should be planning a trip around the world by plane, take more than an hour to get a lesson on how to use your radio. But maybe that’s just me. Reading this reminded me of how much I’ve enjoyed Candace Fleming’s other books and how I should really go read a few more of them. Adding this to my wishlist. I don't much about Amelia Earhart and this seems like a good introduction. I just read this one too! 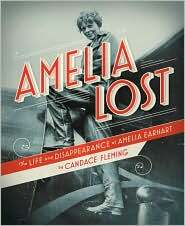 I also enjoyed how she gave little tidbits about Amelia's disappearance throughout the book. I have become a super fan of Candace Fleming this summer. Seriously, everything she writes is genius! Will have to read this. It is interesting that another generation is so fascinated with her disappearance. Three mysterious disappearances that were still "scandals" when I was growing up still haven't been solved: Amelia Earhart, Glenn Miller, and the Lindbergh baby. I also really enjoyed this one. I was completely shocked at how little prep time she put into her flight! If you haven't read her book on PT Barnum, it's really fascinating, too.